12.1 What Absorbs More Heat? Mechanical waves and electromagnetic waves are two important ways that energy is transported in the world around us. Waves in water and sound waves in air are two examples of mechanical waves. Mechanical waves are caused by a disturbance or vibration in matter, whether solid, gas, liquid, or plasma. Matter that waves are traveling through is called a medium. Water waves are formed by vibrations in a liquid and sound waves are formed by vibrations in a gas (air). These mechanical waves travel through a medium by causing the molecules to bump into each other Sound waves cannot travel in the vacuum of space because there is no medium to transmit these mechanical waves. For us to be able to see anything, there must be light. The light can either be from a light source, or it could be reflected light. All light sources are either natural or artificial. The primary source of light [for our planet] is the sun. Even though stars produce light, the sun is the closest star that is close to enough to the earth that gives us that source of light. Even though the moon shines and gives us light, it is not a light source because the moon only reflects the sun's light. Natural sources of light [also include] such things as fireflies and fire. Artificial light sources include [electrical lights, such as incandescent lights, fluorescent lights, neon lights or LEDs, and also chemical lights, such as glow sticks. Reflected light is all around us, bouncing off of objects and into our eyes, giving us perceptions of the shapes and colors of the things around us.] Light is radiant energy that our eyes can see from the visible part of the electromagnetic spectrum. The word usually refers to visible light, which is visible to the human eye and is responsible for the sense of sight. In physics, the term light sometimes refers to electromagnetic radiation of any wavelength, whether visible or not. Gamma rays, X-rays, microwaves and radio waves can also be considered light even though we cannot see them. Light is a form of energy. Light travels in waves. These waves are made of intertwined electric and magnetic fields. Therefore, light is called electromagnetic radiation. Light’s energy is determined by its wavelength. Light with a shorter wavelength has more energy and light with a longer wavelength, has less energy. Our eyes are only capable of seeing visible light. Visible light is only a small portion of the Electromagnetic Spectrum. If light has a slightly shorter wavelength than what our eyes can see, it is invisible to us, but is still very real. This light is ultraviolet light. Light with shorter wavelengths than ultraviolet light fall under the x-ray portion of the spectrum. Light waves with the shortest wavelengths are called gamma rays. Light with a slightly longer wavelength than the reddest color we can see is called Infrared light. Light waves longer than that are called microwaves. And those with the longest wavelengths of all are called radio waves. known to be an invisible part in the EM spectrum. Ultraviolet light is a type of electromagnetic radiation. The ultraviolet light comes from the sun and is invisible to the human eye. Infrared waves are not visible to the human eye alone. Fortunately, with the help of equipment such as infrared cameras, we are able to see them from objects that are warm such as humans and animals. The Scale of the Universe video: http://htwins.net/scale2/ is a great visual description of the size of electromagnetic waves and other objects and phenomena in the Universe. Light travels approximately 300,000 km/sec. = 186,000 miles/ sec. The sunlight that we see here on Earth actually left the Sun about 10 minutes before. The distance from crest to crest or from trough to trough of a wave. Did you know that the sun is not just a source of light, but emits invisible electromagnetic waves also? In fact the sun radiates everything from low frequency radio waves up to high frequency gamma radiation. Some of the radiation is filtered by earth's magnetic field, our ozone layer, and the atmosphere. The radiation from the sun light is actually important to our health, because it allows our bodies to make Vitamin D, but overexposure to sunlight (specifically the ultraviolet radiation) can lead to sunburn and even skin cancer. Light tends to travel very fast and in a straight direction in fact light travels at about 186,000 miles per second. But exactly how straight does light travel well believe it or not light travels perfectly straight until something bends it. These straight paths of light are known as LIGHT RAYS. The reason we see different colors of light is because we have three types of receptors in our eyes (cone cells) that are responsive to different wavelengths. Our brain interprets the input from the cone cells as different shades of color. Light is controlled in three ways and that is either to BLOCK IT, REFLECT IT, or BEND IT. There are many ways light is produced, controlled, and detected and a lot of these ways are around us on a daily basis. Here are some just to name a few: cameras, eyes, scanners, binoculars, photo-copier, internet data transmission, and satellites. Light can be used to determine what an object is made of, even if we cannot touch it. This is possible by measuring the light that is emitted by the object. When light is absorbed by an object, the electron of that object will emit a very specific color of light. This is true for every atom. The reason we are able to determine what an object is made of by analyzing its color is because different atoms emit different colors. For example, when an electron jumps up a step in a hydrogen atom, it emits a different color of light (energy), than an electron jumping up in a helium atom. These two objects will emit two different colors, which will help a person determine what the two objects are made of. The analysis of these colors can be done using a spectrometer. Reflection is energy waves bouncing off the surface of an object. Reflected light always leaves the reflecting surface at the same angle as it strikes the surface. Angle of incidence = angle of reflection. For example, you can picture a ball bouncing. If one drops a ball straight down it will bounce straight back up. If you bounce it at an angle it will bounce up in a angle. In a elementary school you might see this come in effect during their play time as boys and girls bounce balls. These two angles are ALWAYS equal. Polarized Light only lets light through perpendicular, horizontal, or vertical. There are 4 types of polarization. 1. Reflection (Light) For example, glare is a reflection of light (Reflection is light that bounces when it hits things). 2. Scattering (Light) For example, a rainbow is scattering of light. (Red, orange, yellow, green, blue, indigo, and violet are the colors to a rainbow and white light is made of these 7 colors.) During rain, raindrops break sunlight which create prism of white and thus creates a rainbow.) 3. Dichroic (Crystals) For example, The crystal called Tourmaline when moved back and forth to two directions will present different colors. 4. Birefringent (Crystals) For example, Calcite from an Iceland spar double refracts (bends) and has a preferential perpendicular, horizontal, or vertical light. Refraction is energy waves that bend (change direction and speed) as they pass from one type of object to another type. As the speed of light is reduced in the slower medium, the wavelength is shortened. Light does not travel in the same direction in all media. Transmit is when light goes through or passes through a substance or object without being absorbed. Lenses are used everywhere in the world around us. What exactly is a lens? A lens is a transmissive optical device in which light is dispersed by means of refraction (the light gets bent). A lens can be a transparent piece of glass or plastic with one or more curved surfaces. Parallel light rays pass through the thickest part of the lens. These parallel light rays meet after going through the lens which creates a focal point. Lens power is measured in focal length. The focal length of a lens is the distance from the center of the lens to the point at which it focuses light rays. The shorter the focal length, the more powerful the lens. Think about how close you need to hold a magnifying glass for the object to be in focus. How much closer does a microscope lens have to be to the object for it to be in focus? Do not allow any light to pass through, all the energy is either absorbed or reflected and converted into heat. A shadow is a dark area where light from a light source is jammed by an opaque object. It occupies all of the three-dimensional volumes behind an object with light in front of it. 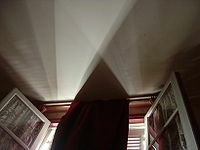 The cross section of a shadow is a two-dimensional silhouette or a reverse projection of the object blocking the light. A point source of light casts only a simple shadow, called an "umbra". For a non-point or "extended" source of light, the shadow is divided into the umbra, penumbra and antumbra. The wider the light source, the more distorted the shadow becomes. If two penumbras overlap, the shadows appear to appeal and join. This is known as the Shadow Blister Effect. The outlines of the shadow zones can be found by tracing the rays of light released by the outermost regions of the extended light source. The umbra region does not receive any direct light from any part of the light source, and is the darkest. A viewer located in the umbra region cannot directly see any part of the light source. By contrast, the penumbra is brightened by some parts of the light source, giving it a halfway level of light intensity. A viewer located in the penumbra region will see the light source, but it is partially blocked by the object casting the shadow. If there is more than one light source, there will be several shadows, with the overlapping parts darker, and various combinations of brightness or even colors. The more diffuse the lighting is, the softer and more indistinct the shadow outlines become, until they disappear. The lighting of an overcast sky produces few visible shadows. The lack of diffusing atmospheric effects in the vacuum of outer space produces shadows that are plain and abruptly defined by high-contrast boundaries between high and dark. For a person or object touching the surface where the shadow is projected (e.g. a person standing on the ground, or a pole in the ground) the shadows converge at the point of contact. The umbra (Latin for "shadow") is the innermost and darkest part of a shadow, where the light source is completely blocked by the blocking body. Such as an opaque object does not let light through it. An observer in the umbra experiences a total eclipse. The umbra of a round body blocking a round light source forms a right circular cone; to a viewer at the cone's apex, the two bodies are equal in apparent size. The distance from the Moon to the apex of its umbra is roughly equal to that between the Moon and Earth. Because the Earth is 3.7 times wider than the Moon, its umbra extends correspondingly farther, roughly 1.4 million kilometers. The penumbra (from the Latin paene "almost, nearly") is the region in which only a portion of the light source is obscured by the sealing body. An observer in the penumbra experiences a partial eclipse. An alternative definition is that the penumbra is the region where some or all of the light source is concealed (i.e., the umbra is a subset of the penumbra). For example, NASA's Navigation and Ancillary Information Facility defines that a body in the umbra is also within the penumbra. The antumbra (from Latin ante, "before") is the region from which the sealing body appears entirely contained within the disc of the light source. An observer in this region experiences an annular eclipse, in which a bright ring is visible around the eclipsing body. If the observer moves closer to the light source, the skirt apparent size of the occluding body increases until it causes a full umbra. Light is made up of wavelengths of light, and each wavelength is a particular color. The color we see is a result of which wavelengths are reflected back to our eyes. Light can be used to determine what an object is made of, even if we cannot touch it. Visible light is a form of electromagnetic (EM) radiation, as are radio waves, infrared radiation, ultraviolet radiation, X-rays and microwaves. Generally composed of a range of wavelengths, each color of light having it's own unique wavelength. Light is composed of seven colors which traditionally identified in the color spectrum: red, orange, yellow, green, blue, indigo, and violet. The first letters of these colors are commonly used as an acronym forming the name ROY G. BIV, to aid in the learning of the color sequence of the visible spectrum. White light is a composite of all visible wavelength. Black is the absence of them. Light refracts or bends when it passes from one medium to another, it displays itself as a spectrum of color as it passes at a slant through a prism- a triangular piece of transparent material, such as glass or plastic. Short light waves are bent more than long light waves, resulting in a separation of the colors in a pattern that extends from violet(shortest wavelength) to red (longest wavelength). When the rays of colored light coming from a prism are focused into a second prism, the pattern of colored light combines to form white light again, verifying that white light is a mixture of the various colors of light. The main source of light on Earth is the Sun. Sunlight provides the energy that green plants use to create sugars mostly in the form of starches, which release energy into the living things that digest them. This process of photosynthesis provides virtually all the energy used by living things. Historically, another important source of light for humans has been fire, from ancient campfires to modern kerosene lamps. With the development of electric lights and power systems, electric lighting has effectively replaced firelight. Some species of animals generate their own light, a process called bioluminescence. For example, fireflies use light to locate mates, and vampire squids use it to hide themselves from prey. In the traditional representation, a complementary color pair is made up of a primary color (yellow, blue or red) and a secondary color (green, purple or orange). For example, yellow is a primary color, and painters can make purple by mixing of red and blue; so when yellow and purple paint are mixed, all three primary colors are present. Since paints work by absorbing light, having all three primaries together results in a black or gray color (subtractive color). In more recent painting manuals, the more precise subtractive primary colors are magenta, cyan and yellow. The RGB color model, invented in the 19th century and fully developed in the 20th century, uses combinations of red, green, and blue light against a black background to make the colors seen on a computer monitor or television screen. 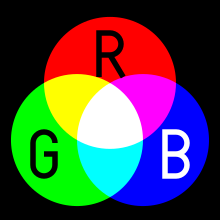 In the RGB model, the primary colors are red, green and blue. The complementary primary–secondary combinations are red–cyan, green–magenta, and blue–yellow. In the RGB color model, the light of two complementary colors, such as red and cyan, combined at full intensity, will make white light, since two complementary colors contain light with the full range of the spectrum. If the light is not fully intense, the resulting light will be gray. While sun rays pass through the atmosphere, some light waves are scattered by molecules of air and dust and smoke particles. Furthermore, violet and blue are very short light waves, meaning that they can be scattered by very tiny particles, even by individual atoms of Oxygen or Nitrogen and other air molecules. You may wonder why some days the sky may look a little more blue. You are seeing the color blue when you look up at the sky because it is primarily the blue light waves that are being scattered in the sky (the reds and yellows continue towards the earth). When there is an enormous amount of smoke and dust particles in the air the longer light waves (which are red, yellow, and orange) are also scatted and the sky takes on a gray or white color (and it is darker because so many of the light rays have scattered). After a thunderstorm the sky may look especially blue again because the rain has washed away the smoke and dust particles out of the atmosphere. The earth is continually spinning, so the part that is exposed to sun rays changes over time. At any moment, the sun is rising some place, directly overhead in another place, and setting on another part of the planet. Sunsets and sunrises are often red or yellow. When the sun is near the horizon (morning and evening), the light is traveling at more of an angle relative to the earth, so the light rays pass through more atmosphere and more of the light rays get scattered by dust. The blue light gets scattered first, then the longer wavelengths such as red, orange, and yellow may get scattered. If they do, then the end result is a beautiful display of warm colors across the sky. If there is more smoke or dust in the atmosphere, the sunrises and sunsets will be redder. When a person looks at large body of water like the sea or beach what you are really looking at is a reflection of the blue sky, rather than the color of the color of the water itself. In fact water molecules absorb red light the red is removed by the water, and the complementary color of red. The end result is the blue-green color we might see in lakes or rivers. Why is it common to wear light color clothing on a hot summer days? Let's experiment light color heat and some water to find out. 1. Wrap the white paper around the jar or drinking glass using and elastic band or sellotape to hold it 2. Do the same thing to the Black paper and the other jar. 3. Fill both jars with the same amout of water. 4. Leave both jars out in the sun for the same amout of time and record you see happening at every hour. Dark surface such as the black paper absorb more light and heat than the white paper. Now measure the temperature,are they the same or different? They black paper jar is hotter than thre white papaer jar. Learn how to make a rainbow with this fun science experiment for kids. Using just a few simple everyday items you can find out how rainbows work while enjoying an interactive, hands on activity that’s perfect for kids. 1. Take the glass of water and paper to a part of the room with sunlight. 2. Hold the glass of water (being careful not to spill it) above the paper and watch as sunlight passes through the glass of water, refracts (bends) and forms a rainbow of colors on your sheet of paper. 3.Try holding the glass of water at different heights and angles to see if it has a different effect. While you normally see a rainbow as an arc of color in the sky, they can also form in other situations. You may have seen a rainbow in a water fountain or in the mist of a waterfall and you can even make your own such as you did in this experiment. Rainbows form in the sky when sunlight refracts (bends) as it passes through raindrops, it acts in the same way when it passes through your glass of water. The sunlight refracts, separating it into the colors red, orange, yellow, green, blue, indigo and violet. Look at the straw from the top and bottom of the glass. Look at the straw from the side of the glass and focus on the point where the straw enters the water. What is strange about what you see? Our eyes are using light to see various objects all the time, but when this light travels through different mediums (such as water & air) it changes direction slightly. Light refracts (or bends) when it passes from water to air. The straw looks bent because you are seeing the bottom part through the water and air but the top part through the air only. Air has a refractive index of around 1.0003 while water has a refractive index of about 1.33. Try this quick quiz and test what you have learned by reading this chapter! What is the primary source of light for our planet? The Electromagnetic Spectrum is put in order by? At what speed do electromagnetic waves travel? Lens power is measured in? True or false? The Umbra is the innermost and darkest part of a shadow, where the light source is completely blocked by the blocking body? ↑ Hammond, Lee (2006). Acrylic Painting With Lee Hammond. North Light Books. ISBN 9781600615801. https://books.google.com/books?id=yQuM4LYlB_IC&pg=PA17&dq=paint+violet+mix+red+blue&hl=en&sa=X&ei=Dwi0UaDqIIHoiwLE64DQCA&ved=0CFIQ6AEwBA#v=onepage&q=paint%20violet%20mix%20red%20blue&f=false. This page was last edited on 23 July 2018, at 05:26.